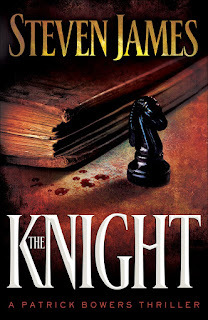 When I agreed to review The Knight I did not realize that it was actually the third book in a series by Stephen James. I usually will not read a series out of order, but was thrilled to find that The Knight was great standing alone. I had no trouble following the plot or understanding the characters. I do plan on getting the other two books, as now I am intrigued as to what transpired in them to help shape the characters in this one. Special Agent Patrick Bowers is our hero. He is a thirty-something widower, raising a very intelligent and head strong teenage stepdaughter. Special Agent Bowers trackers serial killers using a method some critics find quite unorthodox. He tracks the geospatial intersection of killer and victims, believing that when you figure out the area a killer hunts in you will find the killer. He is very determined and good at what he does. His life is somewhat complicated, but he tries to keep home at home and work at work. I really liked that about his character. The Knight finds Bowers testifying at the trial of a serial killer he apprehended and being questioned about that arrest. I warn you, the description of what this killer did to his victims is quite graphic and very unsettling. There are twist and turns here I cannot divulge, but something as mundane as going to court can turn into a big event. He is also being stalked by a man who calls himself Shade. The authorities know who he is, know where he is mailing his threatening letters from, but just cannot find him. As a threat to his life and that of his stepdaughter Tessa's, Shade weighs heavy on Bowers mind. As if all that wasn't enough, there is a new killer for Bowers to track down. Giovanni is reenacting an ancient manuscript, carrying out a series of grisly, tortuous murders. At each scene he leaves little things to taunt Bowers, trying to pull him into the sick game. The hunt for Giovanni takes Bowers and the reader on a wild ride, through unbelievable, unexpected twists and turns leading to the big finale. I really enjoyed this book. It can be quite graphic; at some points I had to stop reading because the descriptions of the torture some of the victims went through was just so vivid. That said, I love an author who can pull you into his story. The kind who writes so you can see it all in your head like a movie. Stephen James does this beautifully. I really enjoyed going along for the ride with Bowers and company while he tracked Giovanni. The characters are well written, the plot keeps you on the edge of your seat, and you end up wanting to read more from the author and these characters. There is so much I haven't written that adds to the story, but I do not want to spoil it for anyone. I just highly recommend you go get a copy of The Knight and read it for yourself. If you like mystery, action, or thrillers then this will be a hit! Available August 2009 at your favorite bookseller from Revell, a division of Baker Publishing Group.